A member of our group had told us of a restaurant a friend had suggested that had the best spareribs in Europe and possibly the world. A web search backed up this claim, and added that the steaks were pretty good also. It was early, but it had been suggested that as the place is tiny, it is best to arrive by 18:00. It was a short walk from where we were on Herengracht to #41 Kerkstraat and the Cafe de Klos. The place is tiny, with a rectangular bar with stools, 3 tables with chairs and a few shelves with stools. Cafe de Klos is dimly lit, with pure pub atmosphere and the smell of the ribs is overwhelming. Carrol and Larry had joined us and we were early enough to secure a table. The ribs come either barbecued or smoked, and we all opted for the former. We enjoyed an Amstel beer while we were waiting and another with the meal. The portions are huge, served with delicious cole slaw and French bread. Large baked potatoes are available as a side dish. These are the best pork spareribs ever. High quality, extra lean, meaty beauties deliciously marinated and grilled crisp on the outside and tender and juicy inside, with no extra sauce slathered on before serving. Hurray, somebody finally got it exactly right - for our taste anyway. Our recommendation is that one order be shared by two, with an extra salad and/or baked potato. The staff is Amsterdam, carefree and fun. If you love ribs, catch the next flight. Heading back to the hotel as we were passing the floating flower market, we spotted Australian Homemade at Leidsestraat 59. As we drew closer the distinct smell of fresh chocolate was overwhelming as well as the sight of folks ostensibly enjoying their ice cream cones. Did I say big orders of ribs? What ribs? We had never seen this Aussie Homemade chocolates and ice cream shop before and who knew when we would again? Let's do it now! Sensational ice cream, they feature four or five different flavors of ice cream and sherbet every day. We all chose chocolate chip - creamy and loaded with delicious bits of chocolate, the perfect blend and texture without being overly rich, served in great sugar cones. There is another location in Amsterdam at Singel 437. For a location near you, visit their web site or write to them at info@australianhomemade.com. At the end of the tour, we returned to Amsterdam for one evening en route to Switzerland. The 13:18 train from the airport arrived at Central Station at 13:33 and it took us a leisurely 20 minutes to walk to the Ambassade Hotel at Herengracht 341, info@ambassade-hotel.nl. This is the way to live in Amsterdam; it's a pity we had only one night. From the moment we entered the cozy lobby and glanced into the adjoining sitting room furnished with marvelous antique furniture, clocks and paintings, we felt this was a special place. The attentive and courteous staff greeted us warmly adding a nice, personal touch to the elegant and intimate atmosphere. 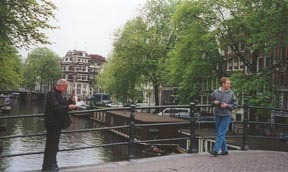 The hotel is comprised of ten adjoining 17th and 18th century canal houses, which are positioned on a lovely spot on one of the most beautiful canals. Our accommodations were a few doors away from the lobby, accessed from the street. The staff insisted on taking our luggage and we soon saw why. 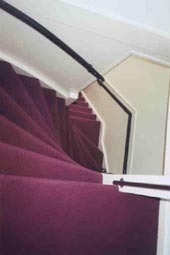 When these homes were built, it was common to build vertically to avoid paying land taxes, thus we encountered the steepest winding staircase we had ever seen. Climbing to the top was an adventure, even sans luggage, but oh, the reward! We opened the door to a posh apartment with large living and dining room, complete kitchen, king bedroom and large bathroom with tub and stall shower. Floor to ceiling windows gave onto spectacular views of the canal, gabled homes and bridges. Completely by chance our friends Gretchen and Ray, who were on a cruise, were docked overnight in Amsterdam and we agreed that we'd meet them for dinner at Cafe de Klos. Yes, back to the same place, but it was more than two weeks since our visit there, they both love ribs and we wanted to try the steak. In the meantime, with time to spare we set off to cover parts of the city we didn't get to during our last brief visit. We asked the hotel staff for restaurant ideas for our next visit and they told us to go to Spuistraat, just behind the hotel. We can't wait until next time. The colorful, lively street is a food-lover's delight. We spent an hour reading menus and smelling the wonderful aromas that are emitted by fine kitchens. As we drank in the pulse of the city, the bike riders of all ages, the ethnic diversity, the carefree and gregarious attitudes, the joining of centuries old buildings with water and neat bridges, its well-earned reputation for tolerance and individualism, we came to love this city. This is very significant because after our first visit in 1980, with our young daughters, we were very turned-off. It's not that the city has changed that much, it's that as we have become more experienced travelers, we have learned how to look, explore and appreciate. At our suggestion Gretchen and Ray shared an order of the ribs and Ray proclaimed that they were the best he's ever had. The T-bone steak, which we shared, was good, but not great. This is a place for ribs! We all had huge, delicious baked potatoes and our friends agreed that the Australian Homemade ice cream is very special. We enjoyed finishing the evening in the comfort of our living room overlooking the canal and having a good laugh as Ray photographed the stairwell as they were leaving. The hotel offers breakfast in the lovely breakfast room, but we were really in the mood for a lighter start to our day. During our wanderings the previous afternoon, we came across Lunch Cafe Nielsen, Berenstraat 19, a bright and cheerful multi-level breakfast and lunch eatery. The open kitchen is on the lower level, with seating on the main floor and on the balcony. The previous afternoon we had chatted with the lovely woman who owns the place as we enjoyed delicious Illy cappuccino and were impressed with her commitment to service and good food. For breakfast we ordered freshly squeezed orange juice, a very good bagel with cream cheese and smoked salmon with fresh dill and that delicious Illy coffee - the perfect breakfast for a very reasonable price. We reluctantly bade farewell to the Ambassade Hotel and to Amsterdam but heading off to Switzerland made it more bearable.